Proteomic studies have provided valuable information to strengthen our perception of a molecular biodosimeter. After 15 min exposure to ionizing radiation, five altered proteins in lymphocytes involved in cytoskeleton and cellular glycolysis have been identified. The measurements of altered protein concentration could have ultimate biological relevance in terms of biodosimetry. Szkanderová et al. also reported time-dependant kinetics of 14 altered proteins in human T-lymphocyte leukemia (MOLT-4) cells associated with various cell signaling pathways, protein degradation, malignant transformation, and detoxification processes. Genomic method like DNA microarrays are sensitive, but the modulated gene expression may not necessarily correlate with the changes in protein concentrations. Further, how these changes manifest themselves in real time remains far from understood. Hence, the primary objective of this study was to come up with a basket of RRGs and RRPs that are altered in human peripheral blood lymphocytes (HPBL) exposed to γ-irradiation. Once an RRP or a set of RRPs are identified and validated, it can become a useful biomarker of biological response to irradiation. This biomarker RRP, especially from HPBL, can potentially be used for biodosimetry. Circulating lymphocytes represent a sensitive target of radiation injury. They are also highly responsive in terms of induced gene expression changes and relatively easily biopsied. For this reason, they have always been used in biodosimetry, and we have also focused our research on this target tissue in this study. Using a genomic-to-proteomic approach, we have first performed DNA microarray profiling of gene expression immediately after ex vivo irradiation of freshly drawn whole blood of consenting and healthy human volunteers of both genders and different age groups. The blood samples were exposed to different doses of γ-radiation delivered at two dose rates (high and low) and immediately subjected to DNA microarray analyses. After a thorough data mining and detailed analyses of the DNA microarray datasets using various tools of bioinformatics, we have identified a basket of twenty “candidate” RRGs, which were significantly up- or down-regulated following irradiation with dose–response curves of straight-line nature. The candidate RRGs needed to be further validated using real-time quantitative polymerase chain reaction (RT-qPCR or qPCR) to identify potential “candidate” RRGs at mRNA level suggesting that these could lead us eventually to identification of the RRPs, the potential biomarkers required for molecular biodosimetry. Under identical conditions, we have also prepared the dose response calibration curve for ionizing radiation-induced dicentrics by the gold standard DCA assay. We further assessed the correlation between the molecular (RRG/RRP) and the cytogenetic (DCA) dose-responses to ascertain whether or not our approach was okay. This work is ongoing. Doses of 0.5, 1, and 2 Gy γ-ray were delivered to samples using 60 Co Teletherapy System (Bhabhatron–II, BARC, India) irradiating at ~0.871 Gy/min (n = 4) and ~2.165 Gy/min (n = 4) dose rates. Doses of 0.5, 1, 2, and 4 Gy were delivered using two different qualities of radiation. Samples were irradiated using either 60 Co Low Dose Blood Irradiator (LDBI-2000, BARC, India; 5.5 Gy/min) (n = 11) or X-ray machine (CP-160 [100 kVp, 2.4 mA], Faxitron, USA; 0.5 Gy/min) (n = 18). All samples were analyzed either immediately (0 h), after 12 h, or after 24 h postirradiation incubation periods. Results were merged for plotting the dose–response curves (see results and discussion section). Two qualities of radiation (γ-ray and X-ray) and multiple dose rates (8.39, 1.5, 0.649, and 0.5 Gy/min) were used in these experiments to get all dose points (0.05, 0.1, 0.25, 0.5, 0.75, 1, 2, 3, and 4 Gy) for plotting a calibration curve. For γ-irradiation, two different sources were used: (a) Samples (n = 8) were irradiated to 0.5, 1, 2, and 4 Gy using 60 Co γ-ray LDBI 2000 delivering radiation at ~ 8.39 Gy/min and (b) samples (n = 1) were irradiated to the entire range of doses (0.05, 0.1, 0.25, 0.5, 0.75, 1, 2, 3, and 4 Gy) using 137 Cs Gammacell ® 40 (IES, Aomori, Japan) delivering radiation at 0.649 Gy/min. Similarly, for X-ray exposure using CP-160X-ray machine, two dose rates were used: (a) 1 sample was irradiated to 0.5, 1, and 2 Gy at a dose rate of 1.5 Gy/min while (b) another sample was irradiated at 0.25, 0.5, 0.75, 1, 2, 3, and 4 Gy at a dose rate of 0.5 Gy/min. Results were merged for plotting the calibration curves (see results and discussion section). Respective sham-exposed samples served as controls for each of the above experimental groups. Downstream processing of irradiated samples followed either immediately (DNA microarray) 2 h (DCA experiments) or after the indicated postirradiation incubation periods under standard conditions in a CO2 incubator (qPCR experiments). Standard protocol of DNA-microarray analysis of the manufacturer was followed using GeneChip ® PrimeView ™ Human Gene Expression Array (Affymetrix, USA) consisting of 530,000 probes comprising 36,000 transcripts and variants representing more than 20,000 genes. Eight volunteers were recruited for the study, which, to the best of our knowledge and belief, is the largest such study undertaken globally. Normalized data acquired from each of the eight individuals were processed separately using GeneSpring Gx 12.5 software (Agilent, USA). Statistical evaluation of the generated data was performed using one-way ANOVA. Genes exhibiting fold changes ≥1.5 with a statistical significance of P ≤ 0.05 between the irradiated samples (0.5, 1, and 2 Gy) and its controls were the only genes that were considered for further detailed evaluation following several useful tools of the bioinformatics such as, (i) hybridization plot analyses (HPA), (ii) scatter plot analyses (SPA) and (iii) principal component analysis (PCA), etc. After extensive data mining, including hierarchical and the gene ontology algorithm analyses to ascertain the biological processes, molecular function, and cellular locations, a set of twenty “candidate” RRGs have been identified, which exhibited dose–response curves of straight or near-straight line nature in either directly or inversely proportional expression patterns. Consenting donors or volunteers from the local ethnic population group of Shillong have been recruited in the study, which is ongoing. Withdrawal of blood, irradiation, postirradiation incubation, and qPCR methodology has been described in details recently., Blood samples were irradiated, subjected to postirradiation incubation as described in section on “Sample preparation, radiation dose, and downstream processing” and total RNA was isolated directly from the blood using Trizol BD reagent (Sigma-Aldrich, USA) as per the manufacturer's recommendations. RNA sample (1 µg) was converted into cDNA using the high-capacity DNA-archive kit (Applied Biosystems, USA) and following the manufacturer's instructions. qPCR was done using the gene-specific TaqMan™ assays (Applied Biosystems, USA). The gene expression change has been calculated as fold change utilizing the “ΔΔCt” method. Thus, the gene expression fold change is expressed as 2−ΔΔCt. The data were evaluated using the Sequence Detection Software 1.3.1 (Applied Biosystems, USA). Statistical evaluation of the generated data was performed using one-way ANOVA for both the irradiated samples with respect to controls as well as the individual samples with respect to each other. The 18S-rRNA and GAPDH TaqMan™ assays were selected as the endogenous controls or normalizers. The standard International Atomic Energy Agency (IAEA) protocol of DCA assay was followed with minor modifications. Briefly, following irradiation, the whole blood culture was set up with RPMI 1640 medium supplemented with 10% or 20% fetal calf serum and phytohemagglutinin (PHA; 0.0 1 or 0.02 mg/ml). Colcemid (0.05 µg/ml) was added after 0 or 24 h of incubation, and the cultures were harvested 48 or 52 h post-PHA stimulation. Harvested cells were treated with hypotonic KCl solution (60 or 75 mM) and fixed in methanol: Acetic acid (3:1) fixative for slides preparation. The slides were stained with 6% Giemsa stain (pH 6.8) for 15 min and mounted in DPX for microscopic evaluation and counting. We have deployed a step-wise genome-to-proteome approach to eventually identify RRPs as circulating biomarker protein(s) in the liquid tissue of human blood for molecular biodosimetry. Once the circulating RRPs are identified and fully validated in humans, we would isolate and purify the RRP(s), raise antibody against it, and perform appropriate florescence- or ELISA-based quantitative immunoprobe assays to establish a dose response calibration curve of radiation dose versus quantity of the specific RRP(s) to use in molecular biodosimetry of the future. With existing automation of the florescence- or ELSA-based immunoprobe assays, it is easily possible to make this method of molecular biodosimetry, a high-throughput method for biodosimetry of large populations in shortest possible time for triage and medical intervention, which is otherwise not easy to achieve by conventional cytogenetic assays. DNA microarray was performed on the blood samples of eight volunteers recruited for the study. The data obtained from these subjects was subjected to rigorous data mining and analyses using GeneSpring Gx 12.5 software. The results revealed that a large number of genes responded to irradiation either by upregulating or downregulating their expressions. These genes have been categorized as RRGs. With a cutoff fold change of ≥1.5 and statistical significance of P ≤ 0.05 in all irradiated (0.5, 1 and 2 Gy) samples at two different dose rates (~0.875 and ~2.165 Gy/min) with respect to the sham-exposed controls, we got a bird's eye view of expression profile of these genes in profile plots depicting patterns of overexpressed (red) and underexpressed (blue) genes as a function of dose of exposure, following low-dose (0.875 Gy/min) and high-dose (2.165 Gy/min) rate irradiations [Figure 1]. The plots also suggested that at low-dose rate of γ-irradiation, the RRGs expressed relatively more freely [Figure 1]a than at the higher dose rate [Figure 1]b of γ-irradiation. Apparently, at higher dose rate of irradiation, many RRGs seemed to have been silenced and hence, the pattern of gene expression was relatively subdued. The RRGs have been annotated, identified, and analyzed (not shown). Further analysis of the DNA microarray raw data by standard and advanced tools of bioinformatics made it possible to identify “candidate” RRGs for biodosimetry purpose. Briefly, in the first step, the reliability of the DNA microarray experiments was ascertained since it is critical that hybridization of array of cDNA of samples to the GeneChip is efficient. This was vetted by HPA. A good spread of lines is indicative of good hybridization. When the hybridization plots of all eight exposed samples were plotted, the extent of hybridization was not uniform. On removing the outlier data set, the plot of remaining seven samples still showed an outlier. The removal of this outlier gave an acceptable uniform spread of lines in remaining data from six individual samples. Hence, further downstream analysis utilized the data of six homogeneous data sets only. In the next step, PCA was performed, which is a mathematical/statistical tool based on multivariate analyses to unravel the internal structure and variance of the complex data sets emerging from DNA microarray. An approach similar to HPA was employed in this analysis too. Essentially, the principal component of all samples must be well spread in space, represented by X, Y, and Z axes, in DNA microarrays. The PCA of control samples (sham-exposed) for 0.871 Gy/min (low) and 2.165 Gy/min (high) dose rate irradiation groups essentially showed good spread of data points on X, Y, and Z axes. The PCA of eight radiation exposed sample sets, on the other hand, showed a skewed spread of points on the three axes. On removing two outlier sample points, the remaining six sample sets exhibited a good spread of data points on X, Y, and Z axes, on lines similar to HPA. Hence, further downstream analyses utilized these six homogenous data sets only to identify RRGs. In the third step, the data were subjected to SPA to get another overview of gene expression, following irradiation. In SPA, each gene is depicted as a point representing the value of expression of the gene in question in control and in radiation-exposed experimental groups, one plotted on X-axis, and the other on Y-axis. 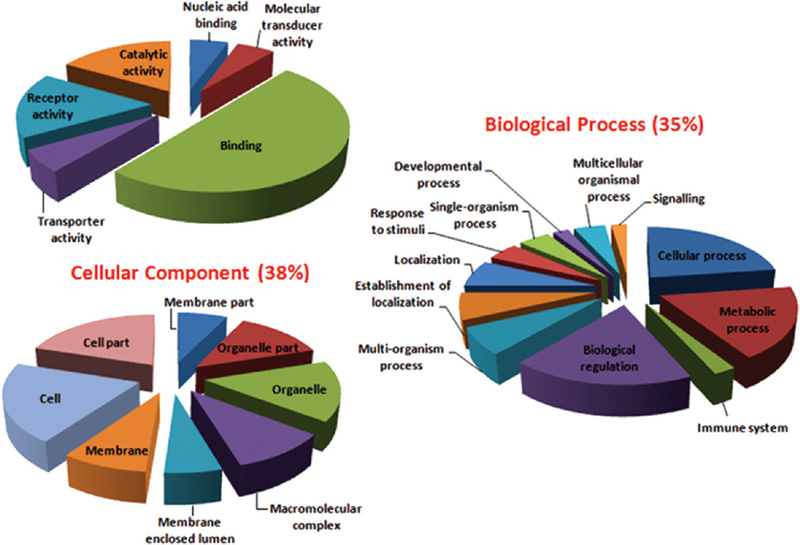 This gives a snapshot of activities of expression of all genes in the samples. Consequently, the genes with equal expression values line up on the diagonal “identity lines” while the genes with higher and lower expression values occupy position above and below, respectively, the identity lines. The snapshot of levels of gene expression following 0.5 Gy, 1 Gy, and 2 Gy radiation exposure at either 0.871 Gy/min (low) or 2.165 Gy/min (high) dose rates clearly indicated that the gene expression was significantly downregulated at higher does rate of irradiation irrespective of dose of exposure. After thorough data mining and processing through the rigors of the above-outlined steps of refinements and analyses, a highly variable number of genes in each of the individual samples at 1.5-folds cutoff with P ≤ 0.05 were obtained [Table 1]. Wide individual variations in number of RRGs in each individual sample were observed, indicating a significant heterogeneity in RRGs in each individual subject. This observation does not only support the general contention that genome-based biomarkers are highly sensitive and the genome of each individual harbor uniqueness but also indicates that biological response to interventions such as radiations may be significantly dependent on the makeup of the genome of the individual. The number of up- and down-regulated genes in each of the two dose rate groups was variable with downregulated genes outnumbering the upregulated genes in general. The biological significance of these observations is not clear and is the subject of future research. Gene ontology analyses of the RRGs were also performed, which places the RRGs essentially in three broad groups – maintenance of biological processes, molecular functions, and organization of cellular components – each managed by nearly one-third of the RRGs [Figure 2]. Finally, the dose-response curves for all RRGs were plotted (not shown) and only those RRGs, which exhibited tendencies of near-linear to linear dose–response curves were considered further. Among such RRGs with near-linear to linear dose–response curves, we found two categories of genes. In the first category, the RRGs were upregulated exhibiting a direct correlation with increasing dose of radiation. In the second category, the RRGs were downregulated exhibiting an inverse correlation with increasing doses. After a careful analysis of DNA microarray data, outcome of bioinformatics analyses and the dose–response curves of RRGs that were present in all individual samples (both genders included) at both low- and high-dose rates and all doses of irradiation, 20 “candidate” RRGs have been identified [Table 2]. The candidate RRG include two pseudogenes (HERC2P4 and MAFIP genes), which are noncoding genes. Since our aim was to identify RRG, which codes for an RRP, the pseudogenes have been excluded from further validation. The remaining 18 “candidate” RRGs seem to have the potential to be used in molecular biodosimetry as (a) they immediately responded to irradiation in a straight to near-straight line (direct or inverse) dose-response patterns and (b) also potentially code for RRPs. They are targets for our further validation steps. 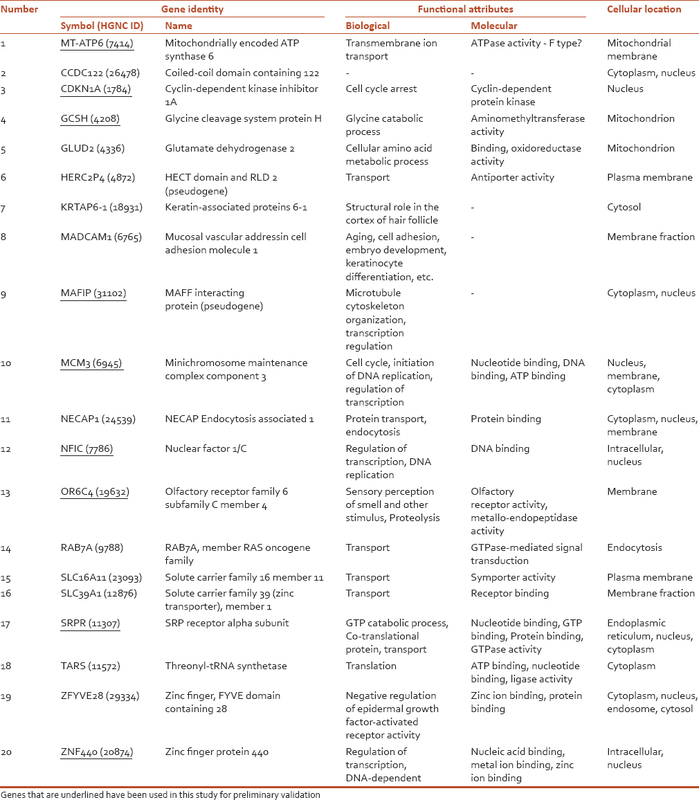 In a two-pronged approach to validate the results, the first or preliminary validation step has been undertaken for nine (MT-ATP6, CDKN1A, GCSH, MAFIP, MCM3, NFIC, OR6C4, SRPR, and ZNF440 genes) out of 18 potential candidate RRGs for their dose-dependent gene expression either immediately after irradiation (0 h) or at 12 and 24 h postirradiation intervals by qPCR [Table 2] – the underlined genes have been covered]. For this study, 18 consenting volunteers (9 males and 9 females) in the age range of 25–35 years have been recruited. Not all nine candidate RRGs tested so far showed tendency of the expected linear dose–response curves at qPCR level. Among the candidate RRGs which did exhibit tendency of linear dose–response curves at qPCR level, we find two categories of responses. In the first category, for example, CDKN1A gene, the dose-response pattern was direct and linear [Figure 3]a,[Figure 3]b,[Figure 3]c. This RRG had a flat dose response curve immediately after irradiation [Figure 3]a, which built up progressively after 12 h and 24 h postirradiation time periods [Figure 3]b and [Figure 3]c. In the second category come the genes, which exhibited a rather weak trend of inverse dose-response curves. 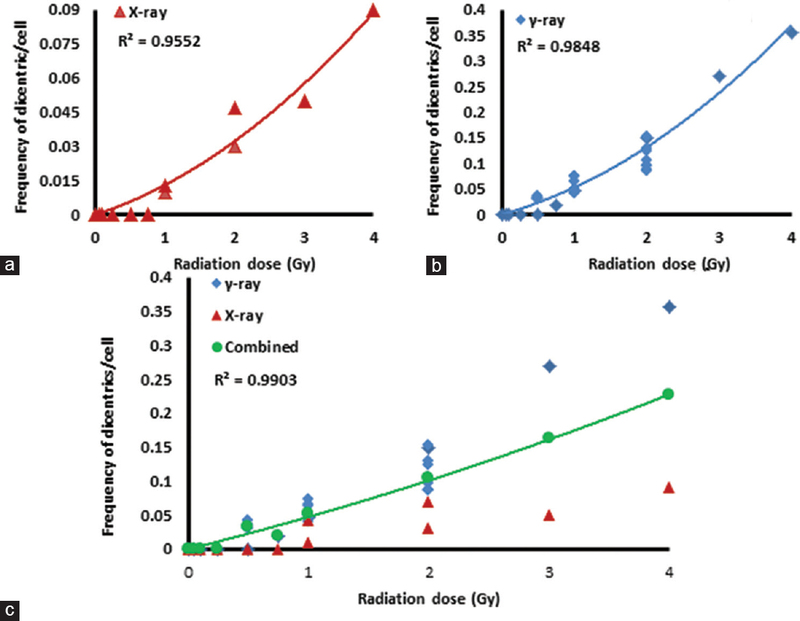 ZNF440 is an example of this category of genes [Figure 3]d,[Figure 3]e,[Figure 3]f. With limited data sets at hand, while CDKN1A shows a clear, direct, and linear dose response with postirradiation period at all doses of radiation exposure [Figure 3]a,[Figure 3]b,[Figure 3]c, ZNF440 shows a weak trend of inverse response for most doses of radiation exposures [Figure 3]d,[Figure 3]e,[Figure 3]f. Although the standard deviation of data at many dose points are rather high [Figure 3], we believe it is due to two facts. First, our data set is currently small, and we need to increase the sample size. Second, molecular parameters such as, RRGs at mRNA level, are highly sensitive biomarkers of cellular response. Hence, they are likely to show pronounced individual variations within a small dataset on such a sensitive parameter. [Figure 4] shows the polynomial dose response calibration plots for DCA in HPBL after ex vivo irradiation of human blood following the standardized protocol of DCA assay. Since different qualities of radiation delivering variable doses at different dose rates have been used in different experiments (see methods section for details), on pooling the data we are likely to mimic a real radiation incident type of situation of human exposure, wherein subjects are likely to be exposed to mixed quality/quantity of radiation. The induction of DCA was observed to begin at a dose of 0.75 Gy for X-ray exposure [Figure 4]a and 0.5 Gy for γ-ray exposure [Figure 4]b. The dispersion coefficient, σ2/y value, of induction of DCA in our dataset was between 0.96 and 0.99, indicating that our data were normally dispersed (Poisson distribution). On combining all X- and γ-ray data, we obtain a generalized calibration curve (r2 = 0.979) shown in [Figure 4]c. The generalized calibration curve [Figure 4]c clearly shows noticeable individual variations in induction of DCA, especially at higher doses, on even this parameter (DCA), which is believed to be significantly less sensitive than the molecular parameters, (e.g., gene expression alteration, etc.). To ascertain whether or not our approach is on the right tracks, we tested the correlation between the well accepted cytogenetic dose–response curves (DCA) and the dose response curve for the RRG obtained at mRNA level by the qPCR assay. [Figure 5] shows the linear regression analyses of DCA calibration curve [Figure 4]c and the qPCR-generated dose response curve for RRGs, CDNK1A, and ZNF440 genes [Figure 3]. The linear correlation coefficient value of 0.99 was obtained between the dose–responses of RRG CDNK1A [Figure 3]c and DCA [Figure 4]c as shown in [Figure 5], top panel suggesting high correlation between the two. Although the r2 value for the same between the dose–responses for RRG ZNF440 and DCA was only 0.095 [Figure 5], lower panel], it has to be kept in mind that the curves were inverse to each other [compare nature of curves in [Figure 3]f and [Figure 4]c. Hence, it appears that our hypothesis of using the proposed RRG as a possible biomarker for biodosimetry is sound as it apparently correlates well with the DCA calibration curve. It is to be noted that different qualities of radiations, dose rates, and postirradiation time points have been used in these experiments to, at least partly, mimic the situation of actual accidental radiological exposure to a population, which is known to be highly heterogeneous. In conclusion, to reach the envisioned goal of developing a molecular biodosimetry technology, in the first step, the most suitable “candidate” RRGs in HPBL needed to be identified. It has been done using the DNA microarray platform and bioinformatics tools. A set of twenty “candidate” RRGs have been identified in [Table 2]. In the second step, the candidate RRGs needed to be screened through preliminary validation step to check whether or not the candidate RRGs expressed to form respective mRNAs under normal physiological condition. qPCR technology was employed for this validation of nine RRGs, which has been completed. Two potential genes CDNK1A and ZNF440 as the likely source of RRPs have been identified [Figure 3]. The dose–response curves for these two RRGs show good correlation with the gold standard DCA based dose calibration curve [Figure 5]. The study is continuing for the remaining nine RRGs. On completion of this study, a set 2–4 “potential” RRPs could be identified. These potential RRPs would be subjected to final validation step, which is planned for the future, to actually verify the presence of the specific RRPs in the liquid biopsy, that is, blood of donors. Western blot, high-performance liquid chromatography, and other analyses shall be employed for this. Once fully validated, antibody shall be raised against the “identified” RRP and a protocol for fluoresce- or ELISA-based immunoprobe quantitative assays for quantitatively monitoring it would be established. Authors are grateful to Dr. B. Dwarakanath (INMAS, Delhi) and Prof. M. Yoshida (Hirosaki University, Japan) for other irradiation facilities and help in conducting some of the experiments. Partial financial assistance for the work came to RNS from IAEA, Vienna (Contract # 17047), NEHU, DBT-Infrastructure Support, UGC-UPE and DST-PURSE. There are no conflicts of interest. A patent application on this work has been filed in India under ICT vide E-2/1772/2014/KOL in October 2014. Lee JK, Han EA, Lee SS, Ha WH, Barquinero JF, Lee HR, et al. Cytogenetic biodosimetry for Fukushima travelers after the nuclear power plant accident: No evidence of enhanced yield of dicentrics. J Radiat Res 2012;53:876-81. Salimi M, Mozdarani H. Different aspects of cytochalasin B blocked micronucleus cytome (CBMN cyt) assay as a comprehensive measurement tool for radiobiological studies, biological dosimetry and genome instability. Int J Radiat Res 2015;13:101-26. Miura T, Nakata A, Kasai K, Nakano M, Abe Y, Tsushima E, et al. A novel parameter, cell-cycle progression index, for radiation dose absorbed estimation in the premature chromosome condensation assay. Radiat Prot Dosimetry 2014;159:52-60. Durante M, Furusawa Y, Gotoh E. A simple method for simultaneous interphase-metaphase chromosome analysis in biodosimetry. Int J Radiat Biol 1998;74:457-62. Miller AC, Luo L, Chin WK, Director-Myska AE, Prasanna PG, Blakely WF. Proto-oncogene expression: A predictive assay for radiation biodosimetry applications. Radiat Prot Dosimetry 2002;99:295-302. Shimura T, Yamaguchi I, Terada H, Robert Svendsen E, Kunugita N. Public health activities for mitigation of radiation exposures and risk communication challenges after the Fukushima nuclear accident. J Radiat Res 2015;56:422-9. Nagataki S, Takamura N, Kamiya K, Akashi M. Measurements of individual radiation doses in residents living around the Fukushima Nuclear Power Plant. Radiat Res 2013;180:439-47. Amundson SA, Bittner M, Fornace AJ Jr. Functional genomics as a window on radiation stress signaling. Oncogene 2003;22:5828-33. Long XH, Zhao ZQ, He XP, Wang HP, Xu QZ, An J, et al. Dose-dependent expression changes of early response genes to ionizing radiation in human lymphoblastoid cells. Int J Mol Med 2007;19:607-15. Paul S, Amundson SA. 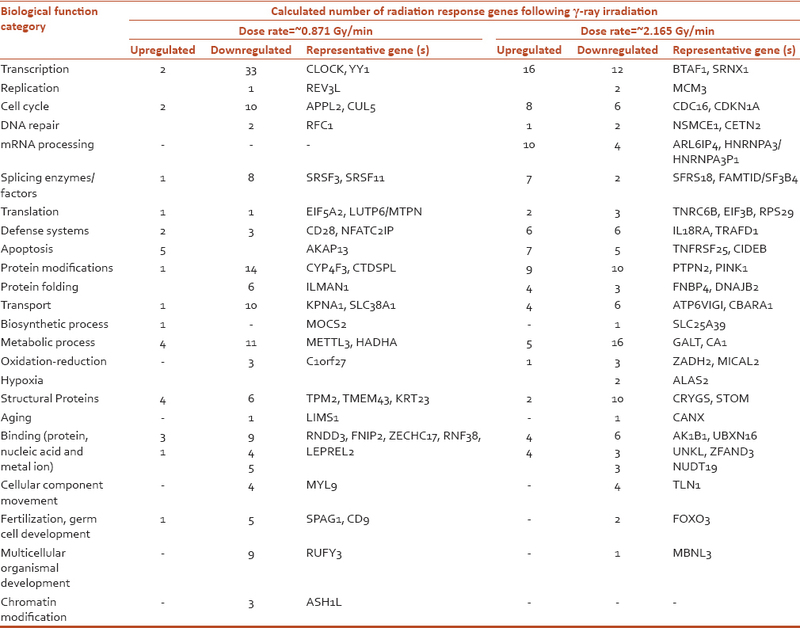 Development of gene expression signatures for practical radiation biodosimetry. Int J Radiat Oncol Biol Phys 2008;71:1236-44. Turtoi A, Sharan RN, Srivastava A, Schneeweiss FH. Proteomic and genomic modulations induced by γ-irradiation of human blood lymphocytes. Int J Radiat Biol 2010;86:888-904. Sharan RN, Turtoi A, Srivastava A, Schneeweiss FH. Proteomic and genomic approach to understanding γ-radiation induced early cellular response: Biotechnology in radiation counter-measures. In: Hasnian SE, Rashmi JB, Sharan RN, editors. Biotechnology for Sustainable Development – Achievements and Challenges. New Delhi: McGraw Hill Education; 2010. p. 93-208. Amundson SA, Do KT, Shahab S, Bittner M, Meltzer P, Trent J, et al. Identification of potential mRNA biomarkers in peripheral blood lymphocytes for human exposure to ionizing radiation. Radiat Res 2000;154:342-6. Amundson SA, Grace MB, McLeland CB, Epperly MW, Yeager A, Zhan Q, et al. Human in vivo radiation-induced biomarkers: Gene expression changes in radiotherapy patients. Cancer Res 2004;64:6368-71. Dressman HK, Muramoto GG, Chao NJ, Meadows S, Marshall D, Ginsburg GS, et al. Gene expression signatures that predict radiation exposure in mice and humans. PLoS Med 2007;4:e106. Szkanderová S, Vávrová J, Hernychová L, Neubauerová V, Lenco J, Stulík J. Proteome alterations in gamma-irradiated human T-lymphocyte leukemia cells. Radiat Res 2005;163:307-15. Vaiphei ST, Keppen J, Nongrum S, Chaubey RC, Kma L, Sharan RN. Evaluation of endogenous control gene (s) for gene expression studies in human blood exposed to 60 Co γ-rays ex vivo. J Radiat Res 2015;56:177-85. Sharan RN, Nongrum S, Keppen J, Vaiphei ST, Kma L, Chaubey RC. Future of radiation bio-dosimetry: Molecular bio-marker. In: Sharma GJ, Sharan RN, editors. Current Topics in Redox Biology. New Delhi: McGraw Hill Education; 2014. p. 66-81.